A local rabbi crashed a city council meeting in Washington DC Tuesday to berate the council for failing to act against two members who made anti-Semitic statements. 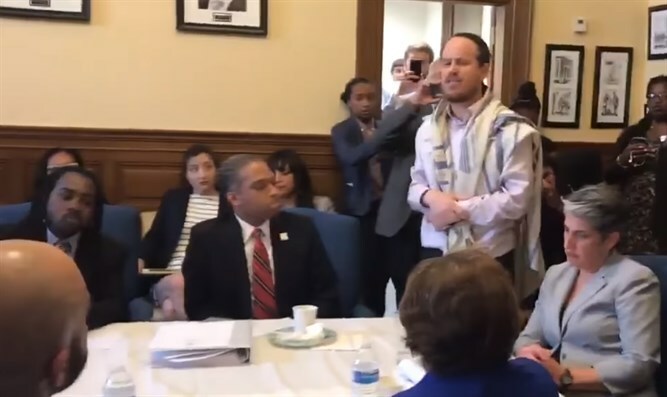 Rabbi Shmuel Herzfeld, the spiritual leader of the Ohev Sholom synagogue, entered the meeting wearing a tallit, a traditional prayer shawl, and yelled at the council members for refusing to censure Trayon White and Joshua Lopez. "Shame on this council for not being willing to censure Trayon, and shame on all of the council for not standing up, and saying that Mr. Lopez needs to resign. This is unacceptable - you know better!" Last week, city official Joshua Lopez held a rally in support of White. During the rally, Abdul Khadir Muhammad, a supporter of notorious anti-Semite Louis Farrakhan, called DC councilwoman Elissa Silverman a "fake Jew" and shouted that Jews were "termites." He then told the council that "this is not a time to be quiet. Our city is better than this." Lopez announced his resignation later Tuesday. Rabbi Herzfeld told the Jerusalem Post that Lopez's resignation was "the right thing to do."